How Long Does It Take to Build an Apartment Building? 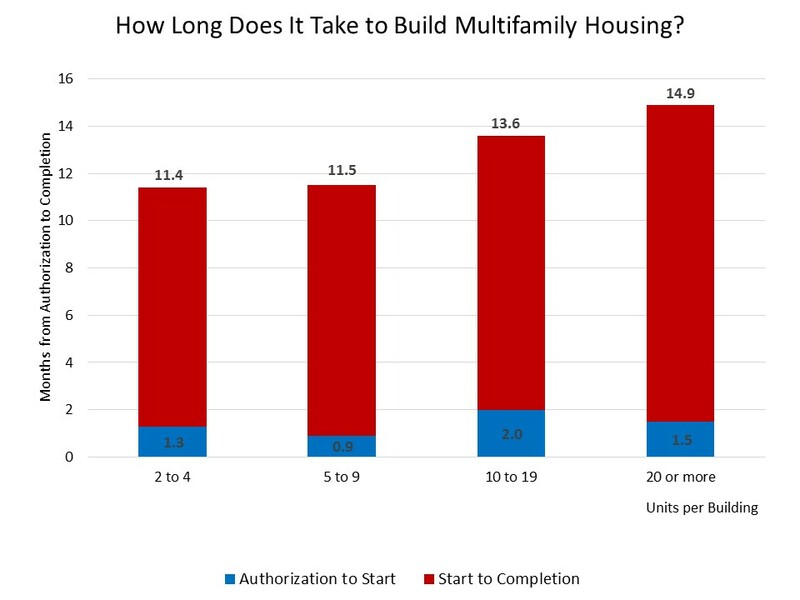 The average length of time to complete construction of a multifamily building, after obtaining authorization, was 11.7 months according to the 2014 Survey of Construction (SOC) from the Census Bureau. 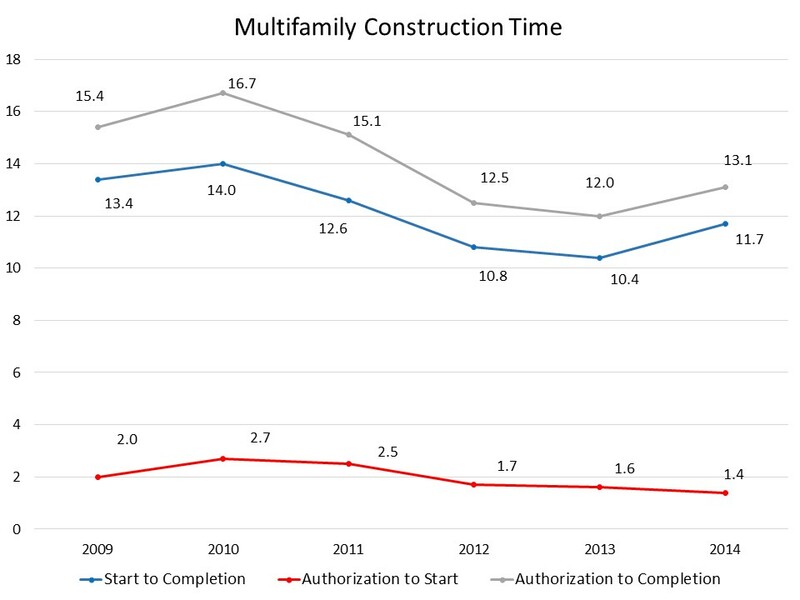 The permit-to-completion time increased by approximately one month from 2013 to 2014, as per unit median square footage and the share of multifamily buildings with 20+ units rose. The average time to build multifamily housing varies with the number of units in the building. In 2014, buildings with 20 or more units took 14.9 months to complete from the time of obtaining permits, whereas properties with 10 to 19 units typically finished in 13.6 months, and 5 to 9 unit buildings came in at 11.5 months. Lastly, 2 to 4 unit buildings required only 11.4 months. The average time from permits to start, however, does not follow the same pattern with respect to property size. Properties with 10 to 19 units had the longest average waiting period, 2 months, in 2014, compared to 0.9 months, the shortest one, for buildings with 5 to 9 units. 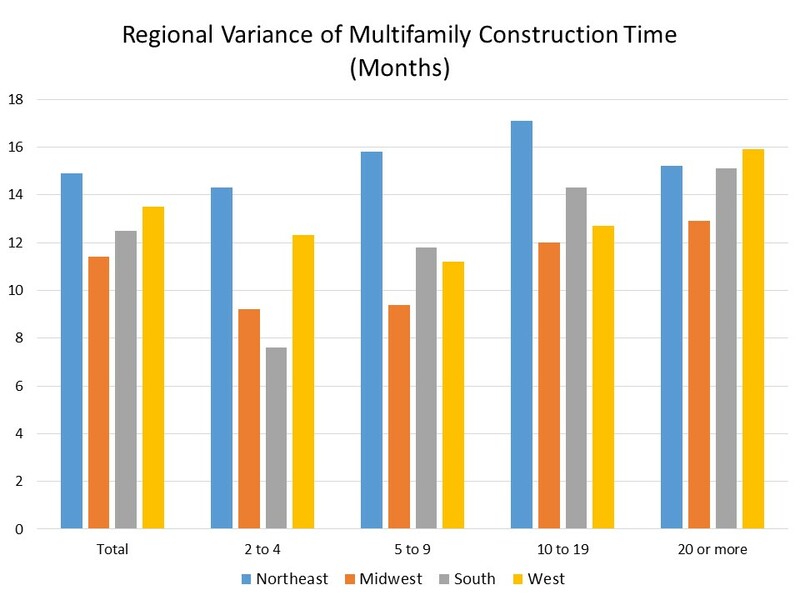 The 2014 SOC data also shows there is a significant regional variation in the average construction duration of multifamily buildings. The Northeast had the longest time from authorization to completion, 14.9 months, followed by the West, 13.5 months, and the South 12.5 months. The shortest permit-to-completion period happened in the Midwest with 11.4 months. Finally, there is regional variation based on property size as revealed in the chart below. This post is a follow-up analysis of a similar look at build times for single-family construction. Great post, it helps me alot for building apartment. Good information for those in Los Angeles seeking to build housing for the homeless. What I’m really looking for is data on number of apartment rental units built in NYC over the last 50 years. My gut feel is that rental apartment pretty much came to a halt after Nixon price controls again brought on additional rent control measures. For the next 25 years, the only apartment construction was cooperatives. Roughly about 1995, the rents that new construction could demand exceeded the maximum rents subject to rent controls, and the rental apartment construction began again. If you have access to data, I’d appreciate it in our fight against rent control in Los Angeles.